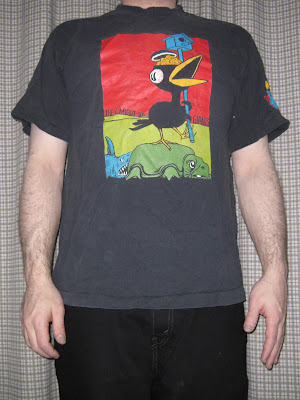 Another work of Tony Millionaire, this shirt features Drinky Crow with his brain popping out. He's carrying his birdhouse and taking a ride on a turtle of some sort which is being stalked by land shark of some kind. 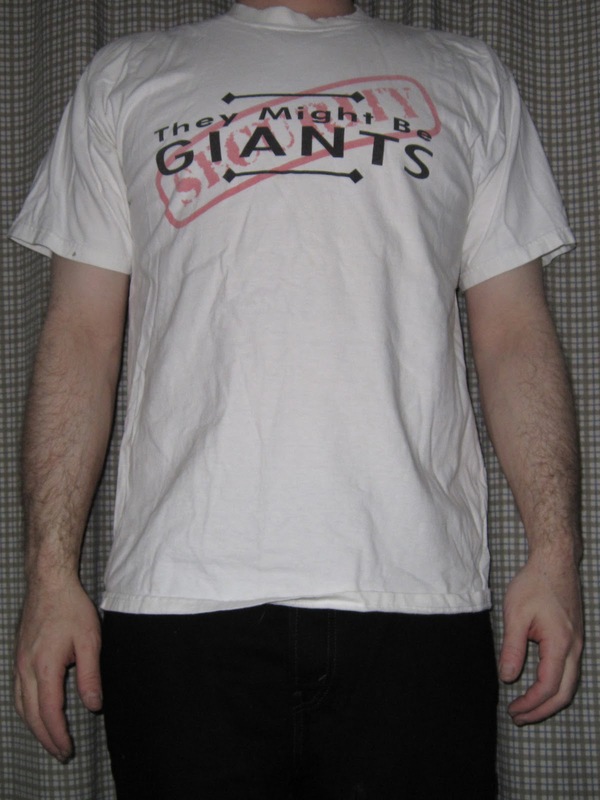 In the distance, on the horizon are the mysterious words, "THEY MIGHT BE GIANTS". 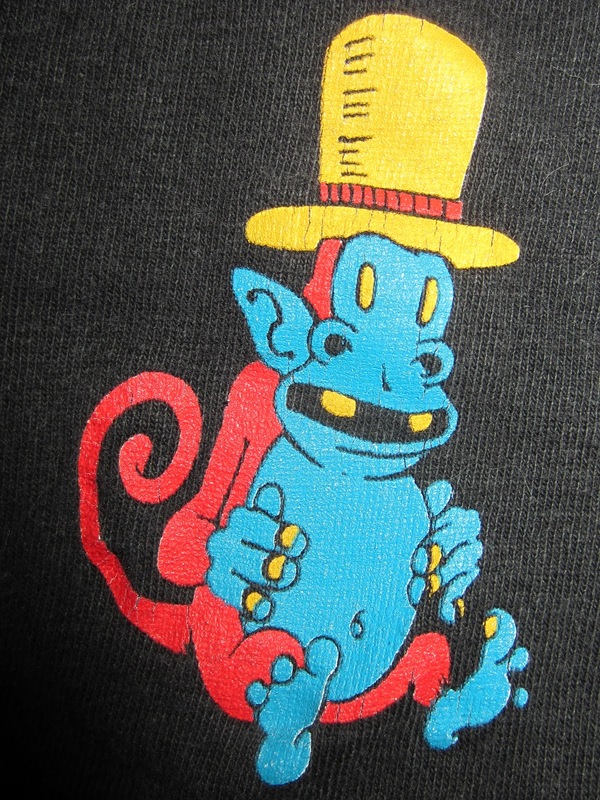 A brightly colored Uncle Gabby is hanging out on the left sleeve. Performed at the Berklee Performance Center in Boston, MA on 10/1/11, featuring Curt Ramm on trumpet. 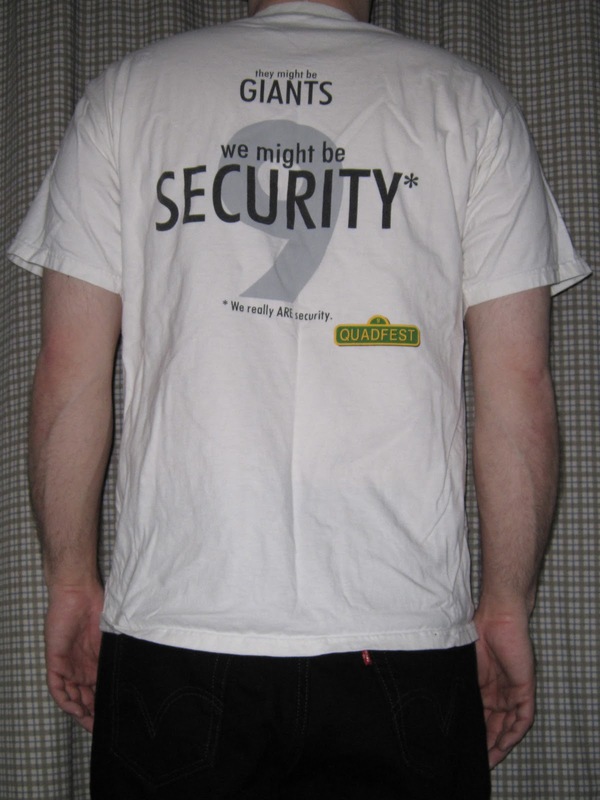 This is a shirt that was worn by student security during the ninth annual Quadfest at Worcester Polytechnic Institute in Worcester, MA on 4/28/01. 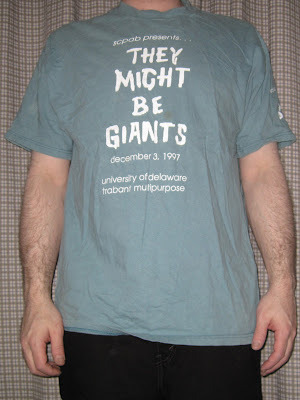 TMBG holds the honor of playing the very first Quadfest back in 1993, and the annual WPI festival continues to this very day. Yes, I really am security. 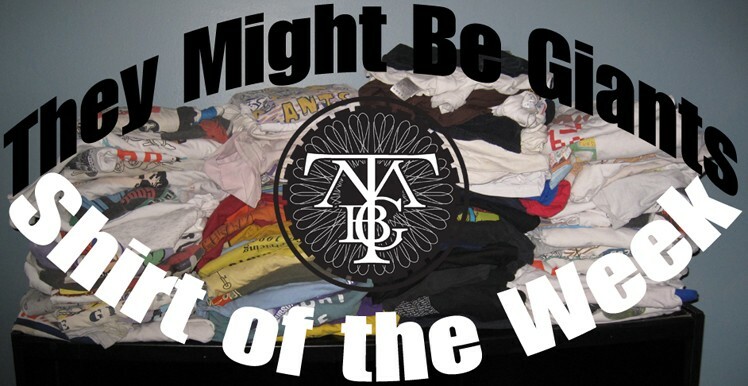 Listen to John Flansburgh tell a story about a monotonous job that he once held which explains the intentional misspelling of the above song title. 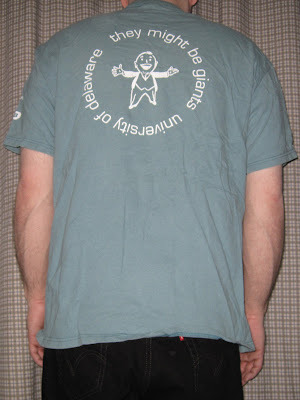 Performed at Mahaiwe Performing Arts Center in Great Barrington, MA on 9/9/11. 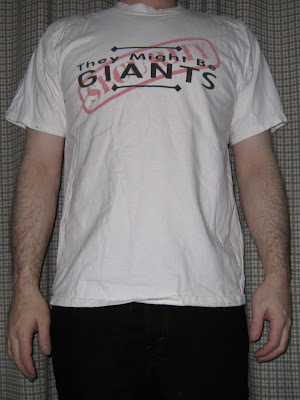 Here's another They Might Be Giants shirt that I don't wear much, simply because I'm not big on long sleeves. 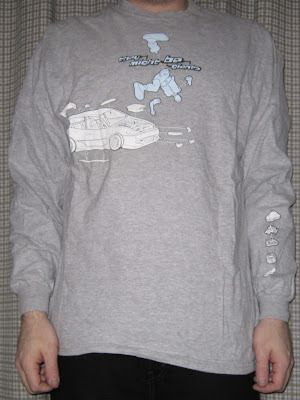 It's the Mink Car shirt, featuring art by The Chopping Block from the decade-old album of the same name. It includes handy directions for sandwich assemblage on the left sleeve. 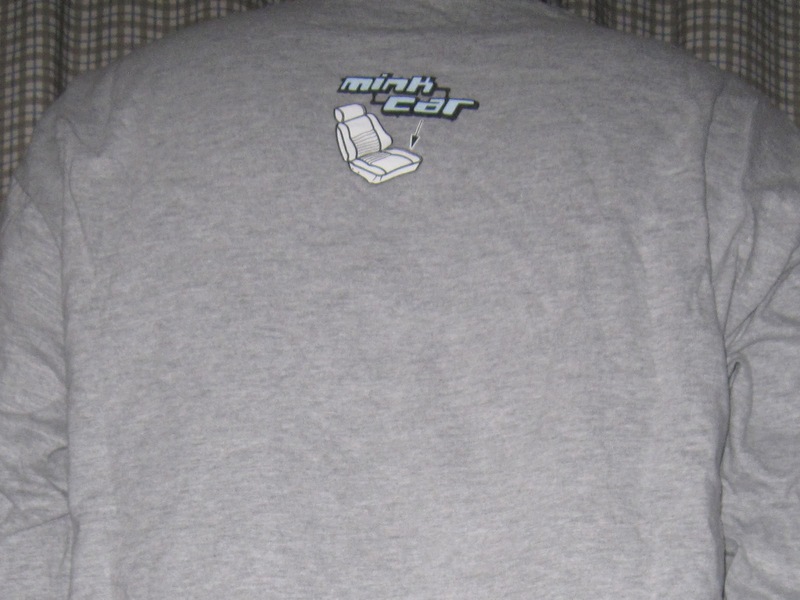 The back is sparsely decorated, with a single Mink Car seat top and center aligned. Performed at the Berklee Performance Center in Boston, MA on 10/1/11. Back in 1997, I attended a concert at the University of Delaware in Newark. I found this shirt commemorating the show on eBay years later. 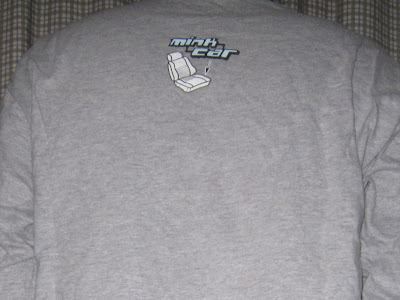 This is the show from which the official Severe Tire Damage recording of "Battle for the Planet of the Apes" was drawn. 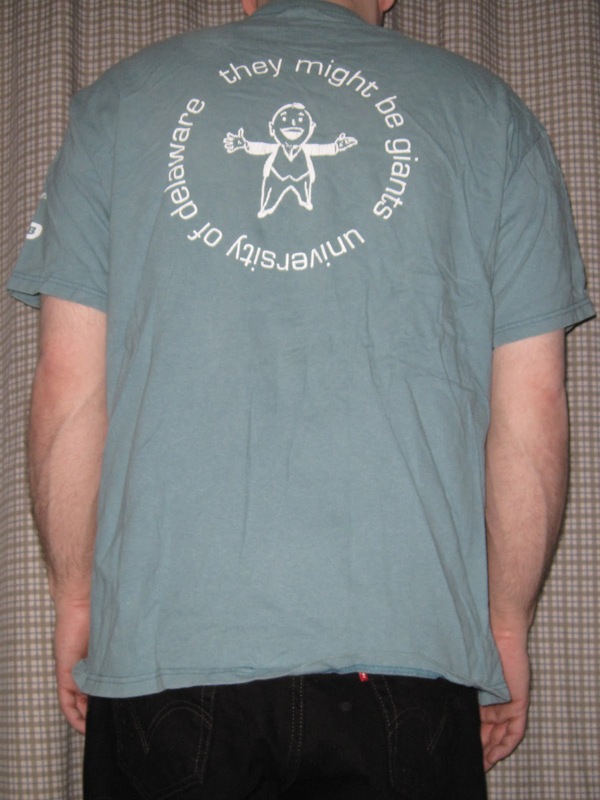 The back of the shirt features the Why Does the Sun Shine? Happy Guy.